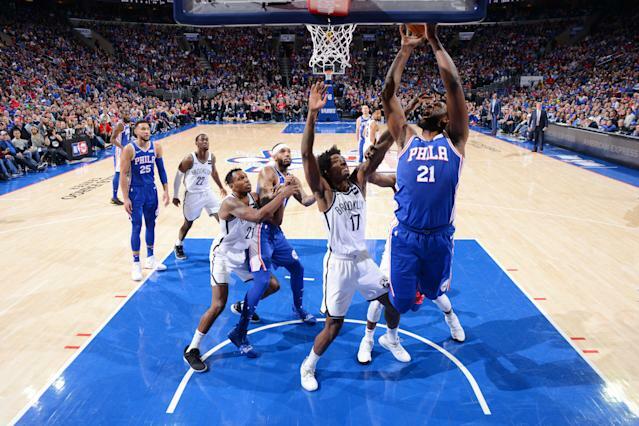 One of the many times the home crowd booed the Philadelphia 76ers in their Game 1 loss to the Brooklyn Nets came early in the second quarter, when 7-footer Joel Embiid pulled up and clanked a wide-open three. He shoots without impunity from deep, despite connecting on just 30 percent of his attempts in the regular season. On Saturday, he went 0-of-5. Maybe Embiid, in classic podium parlance, was complaining about a problem he simultaneously absolved himself of experiencing. You know, as one does. I say this because he did indeed hesitate to pull up in Game 2, and it was to the Sixers’ benefit. So much of playoff success is determined by an ability to be disciplined enough to not fall into the rhythm of the opposing team, to not being goaded into what seems like a reasonable move in lieu of a good one. At one point, Embiid pump-faked from the 3-point stripe (against no one in particular because he was wide open), used the space for a running start, Euro-stepped into Jarrett Allen, finished the lay-up and went to the line. At another, he met Allen five feet into the paint where he was waiting for Embiid, who posted him up and nailed a short jumper. He did not attempt a single three, and save for one baseline face-up jumper, all of Embiid’s attempts in Game 2 were from inside the paint. Embiid imposed his will, employing patience against double-teams, waiting for them to step away, spinning and finishing on the other end, or merely rising up over the top of multiple bodies. Does it help the Sixers when he can occasionally hit a three? Sure. But it might be time, despite modernity and the restrictions it tries to impose on what constitutes a good shot, to accept that Embiid is best playing like a true throwback, a silhouette of Shaq more than Karl-Anthony Towns. The league has been running away from that style for a long time, but on the bright side, that means only a precious few will be equipped to guard it. D’Angelo Russell has come a long way since being exiled by the Los Angeles Lakers for not knowing when to put his phone away and not being Lonzo Ball. He’ll likely finish second to Pascal Siakam for this year’s Most Improved Player Award, but I think he’ll be in the running pretty soon again. The most exciting thing about Russell isn’t how far he’s come. It’s how flawed he still is. Russell is a promising playmaker who throws caution to the wind far too much, and he takes too many floaters and midrange jumpers. Against the 76ers in Game 2, it took him the better part of a half to realize four feet isn’t enough of a runway to outpace Joel Embiid’s towering frame. He doesn’t self-adjust well quite yet, which is why he spent so many fourth quarters riding the pine early in the season. He’s clearly still finding his way as a No. 1 pick-and-roll practitioner — sometimes, when he turns around and looks for the trailing big man, he forgets to turn his eyes back toward the basket before unfurling layups and teardrops. He’s also an All-Star at 23 years old, gaining a bevy of playoff experience in an organization that’s hyper-focused on identifying and eradicating little flaws. Imagine how good he’ll be when he actually looks at the rim. Give Doc Rivers this: He might have failed to wrangle in the competing personalities of Chris Paul and Blake Griffin, but the man understands stars. He fused the 2008 Celtics into champions — the precursor to the modern superteam — with “ubuntu” and he read opposing stars like open books. Rivers understands body language, psychological motivators and how he can use them to inform his game plan. During the Celtics’ 2010 playoff run, Rivers identified that LeBron James had one foot out the door in Cleveland. Rivers could see what James was seeing — a team that wasn’t good enough to give him a reason to give it his all — so he implored the Celtics to apply some added pressure to see if LeBron would disengage. During the Finals that year, Rivers also guessed that Kobe Bryant’s compulsion for individual glory would prevent him from being able to pass out of double-teams in Game 7, so he told his players to surround Bryant. The Lakers won, but their offense sputtered, and Byrant finished 6-of-24 from the field. All of which leads me to a fun, convoluted theory: Was part of the Clippers’ epic 31-point comeback in Game 2 of their first-round series against the Warriors powered by the realization that Kevin Durant, who is rumored to be on his way out of Golden State at the end of the year, would be passive? It’s already one thing for Durant to pass out of post-ups and reset the offense when he finds Danilo Gallinari and Patrick Beverley — who Durant has nearly a foot on — among others, standing in front of him. It’s another to remember those guys were commissioned by their own coach to do so, and do it without help. Maybe I’m jumping through too many hoops here. Or maybe, like he has many times before, Rivers sensed something before the rest of us did. Boban Marjanovic, a giant by the standard of giants, long ago proved that he is more than just a fun NBA sideshow, pairing excellent IQ with a 7-foot-3 frame to convert dunks and layups when defenders tilted away from him. Now he’s nailing jumpers in the playoffs for the 76ers. Marjanovich went 12-of-25 from midrange in the regular season — a nice clip, but that’s less than one shot every four games. But now he’s hitting them when they matter, and more importantly, where it hurts. The Nets have left him wide open at the top of the key in their series against the 76ers in order to stop Ben Simmons’ and Jimmy Butler’s constant onslaughts to the rim, bargaining that Marjanovic will start missing. So far, they’re losing that bet. Over the course of a series, that’s the kind of development that can force adjustments and break a team’s back. The thing that really hurts about DeMarcus Cousins tearing his left quad in the second playoff game of his career is you could feel the final arc of his career on the horizon. From an off-court perspective, he is brutally honest and hates being online — admirable traits for those watching at home. On the court, he was finally figuring out what life is like when you get out from under the weight of dysfunctional organizations. The Sacramento Kings, in particular, have left no reputation unscathed in the past decade, and it’s been so fun to watch Cousins prosper in an environment where it seems like everyone is rooting for him. Now he’s likely out for the remainder of the playoffs, heading into free agency with two major injuries in tow. For all his talent, Cousins’ career might just be a testament to how fickle the NBA is and how much luck dictates outcomes.